A few years ago, I wanted nothing to do with Danganronpa. Its morbid premise—a neon-splattered killing game between sixteen talented high school students—sent chills down my spine. I wondered what joy there was to find in their suffering, to watch their faces twist in anguish as their friends’ bodies piled ever higher in a series of elaborate murder mysteries. It turns out that “joy” isn’t the right word to describe Danganronpa. It’s not a joyful sort of experience, but it is bizarrely compelling; to thumb through its virtual pages is to bear witness to humanity in the most stressful circumstances imaginable, and to awe at their ability to persevere through it all with the right mixture of cunning and intellect. Danganronpa V3: Killing Harmony carries on that legacy with a brand new killing game that remains both deeply unsettling and impossible to put down. 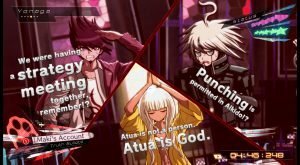 Danganronpa V3 is once again an interactive visual novel that follows a group of high school students, each with an absurd title like “Ultimate Anthropologist” or “Ultimate Cosplayer,” who are confined to a school campus and forced to participate in an absurd game of kill-or-be-killed in order to win their freedom. The only way to triumph in the game is to commit a murder and successfully evade capture in a peer-moderated class trial, meaning that killers have to be creative in order to fool their classmates. If the culprit is unsuccessful, the punishment is no less than their own execution. This makes for a tense game of cat and mouse where killers reveal their true colours in dramatic fashion when their plans start to go awry. 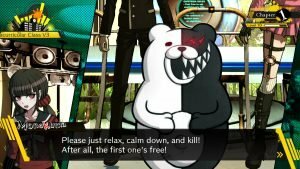 Suffice it to say, Danganronpa V3 contains all of the twists and turns fans have come to expect from the series—and more, really, but to delve into the nitty-gritty of its narrative would rob any prospective player of the authentic Danganronpa experience. 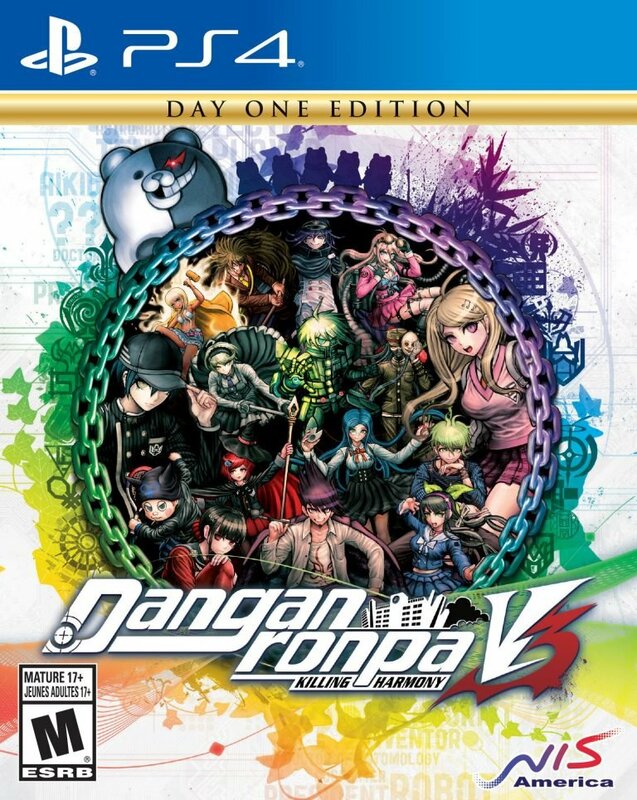 Whereas the original Danganronpa trilogy—which technically includes two main entries, a spin-off shooter, and a pair of complementary anime follow-ups—was centered around the warring notions of hope and despair, Danganronpa V3 is a thematic battle between truth and lies. At least one character is a compulsive liar. Others abruptly change their stories and lie to clear themselves of suspicion when they find themselves in danger. A new mechanic in Danganronpa V3 even has the player intentionally commit perjury themselves from time to time in order to manipulate other characters into changing their thinking. The idea here is that sometimes lies are necessary to find the truth, but the game makes it clear that a penchant for dishonesty comes with a psychological cost. Trial segments return as back-and-forth debates with a sort of manic energy I’d imagine Phoenix Wright might have if he tripled his caffeine intake and never slept. The game attempts to introduce a bit of variety during trials with a handful of mini-games, like a variant of hangman and a stilted Crazy Taxi analogue, but these ultimately feel like filler. Nothing, however, beats the rush of having an “aha!” moment when the disparate pieces of a mystery finally come together during a heated debate. My only real complaint about Danganronpa V3 is that navigating the academy during exploration segments quickly becomes a chore. Fast travel exists, but it’s buried deeper in the main menu than it should be, and travel points aren’t always convenient. More irritatingly, the feature is disabled outright at many points during the game. Not much has changed in terms of presentation with Danganronpa V3. It’s still a visual novel with some light exploration and a story told mostly through static character portraits. A bright colour palette and wild character designs contrast with gruesome scenes of neon pink violence to create Danganronpa‘s signature atmosphere. Composer Masafumi Takada returns to score V3′s excellent soundtrack, a suite of melodies that oscillate between blood-pumping electronica and mood-setting murder-jazz. Its audio presentation is hampered slightly by uneven audio mixing that tends to drown out character voices; this can be alleviated somewhat by adjusting sound levels in the options menu, though it’s not a perfect solution. Danganronpa V3‘s sharply written story undulates between fact and fiction with remarkable finesse. Just when things start to go the player’s way, the game has a tendency to pull the rug out from under their feet. This makes it a wildly unpredictable ride that starts strong and remains compelling throughout. 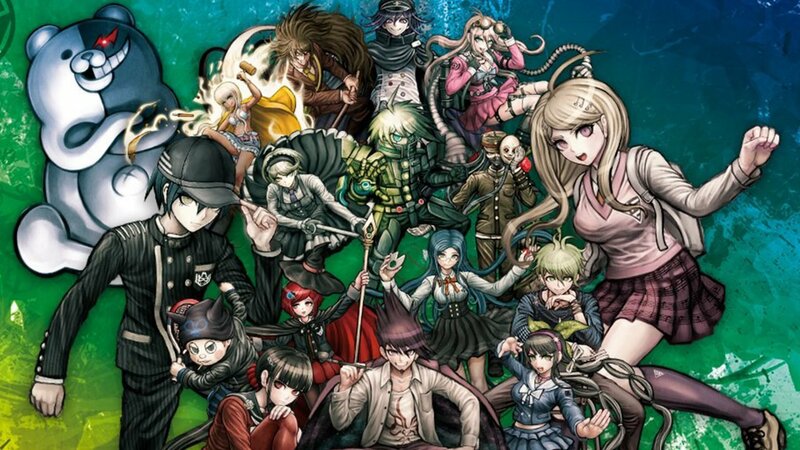 I’m being tight-lipped about the details because it truly needs to be experienced first-hand; believe me when I say that this is one finale that Danganronpa fans won’t want to miss. Liked this article and want to read more like it? Check out Derek Heemsbergen’s Ys SEVEN review and Tokyo Xanadu review! Want to see more videos? Subscribe to our YouTube channel and check out the First Fifteen of Dishonored 2: Death of the Outsider! Danganronpa V3 unravels the series' tightly wound coil of bloody intrigue in spectacular fashion.